In the mid-1980s the phrase The Big Music began appearing in the music press, used to define the musical output of a number of (mainly Celtic) bands such as Simple Minds, U2, Big Country and The Alarm. The term was rather a fatuous one for these outfits actually had very little in common, and its usage represented little more than lazy Saxon journalism. 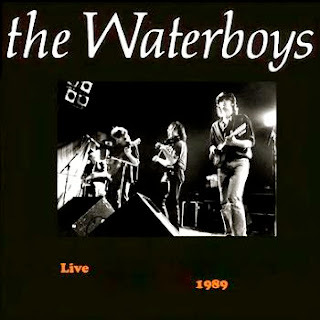 In the eyes of such journos the prime exponents of The Big Music were of course The Waterboys, who had coined the phrase with their 1984 single release of that name. The Waterboys’ first two albums had been stimulating but erratic affairs, and it was only with the aforementioned single and its associated B-side Bury My Heart, that group leader Mike Scott truly began creating the music he had been striving for. His plan finally reached fruition the following year with the This Is The Sea album, wherein Scott’s lyric writing moved away from the occasionally rather introspective musings into more spiritual realms. And yet not overly religiously so, for Scott’s was an almost humanist or even secular spirituality, if that makes any sense. “Come with me on a journey beneath the skin”. England Is Dying was another dig at Mad Maggie, each and every barb finding its mark, whilst Scott’s sublime 12-string guitar strumming and inspirational lyric on the title track closed the collection out perfectly. With the success of the album in UK, the band seemed poised to make the step to Stadium Rockville, but Scott chose instead to wrong-foot everyone by decamping to Ireland to immerse himself in traditional Celtic music, shedding keyboard player Karl Wallinger on the way. The result of this volte face was the equally essential Fisherman’s Blues album, wherein Scott retained much of the lyrical leitmotif of This Is The Sea, whilst setting it alongside more traditional music, where the fiddle work of Steve Wickham was heavily featured. Both the title track and And a Bang On The Ear (the latter a litany of Scott's failed relationships – a bang being a kiss, apparently) were standout cuts. Scott also achieved the very rare trick of managing to cover a Van Morrison song (Sweet Thing) without making a complete Pig’s Ear of things, but my own favourite was The Stolen Child. This saw William Butler Yeats’ famous poem set to music, and showcased some exquisite flute work by Colin Blakey. The song introduced me to the wonderful world of Mr. Yeats, and set me on a path with would take me to Sligo, Rosses Point and Glencar. But that is perhaps another tale. Even now, a quarter of a century later both This Is The Sea and Fisherman’s Blues remain as relevant and as pertinent as back in the day. I truly believe these recordings to be two of the most significant of the second half of the 20th Century. Timeless classics both. This gig was a Hogmanay shindig at Glasgow Barrowlands, and as you may imagine had a wonderful party vibe to it. Although, I personally may have enjoyed proceedings a touch more were I not The Designated Driver for the evening. Much of the set was unfamiliar to me, with there being a number of traditional-sounding reels and jigs, to which we all reeled and jigged. There was, slightly surprisingly, a clutch of Bob Dylan compositions performed – three in all I think, none of which seemed out of place amongst all the Caledonian carousing. A couple of songs which would appear on the following years release Room To Roam were also aired: In Search Of a Rose and The Rattle Taggle Gypsy – this latter ballad a real crowd pleaser. After a rousing rendition of And a Bang On The Ear there was a lengthy interval, one assumes to use up some time to ensure the gig lasted into the New Year; this second-half of the concert bringing forth many of the band’s best known tunes. And just upon midnight with all the Waterboys having changed into kilts, onto the stage strode the City of Glasgow Pipe Band skirling a stirring Auld Lang Syne, after which there was just time for another fiddle reel before we all made our way out into 1990. Probably the best Hogmanay in the World. Has Anybody Here Seen Hank? When will we be Married? can i download this cd ?? hi..do you know where i could download this cd?? ado you know where i could download this cd? ?